1. 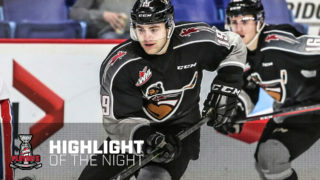 Mark Kastelic, Calgary Hitmen: Calgary Hitmen captain and 2019 NHL Draft prospect Mark Kastelic had a pair of goals and an assist Tuesday as his team began a two-game road trip through Saskatchewan with a 5-2 win against the Regina Pats. Kastelic scored the first two goals of the game for Calgary, then earned a primary assist on the team’s fourth goal. The Phoenix, Ariz. product continues to enjoy a career year with 51 points (32G-19A) in 47 games. Overall, Kastelic has 141 points (73G-68A) in 244 WHL regular season games. 2. 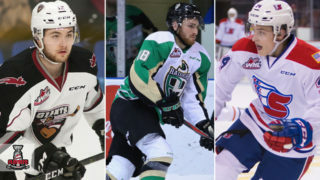 Carson Focht, Calgary Hitmen: Calgary Hitmen forward Carson Focht scored a pair of goals in his hometown Tuesday, helping the Calgary Hitmen to a 5-2 win against the Regina Pats. 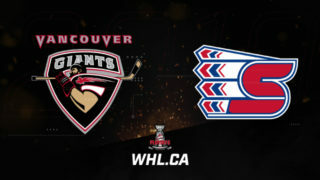 Focht scored the third and fourth goals of the game for the Hitmen, with the first of the two counting as the game-winning goal. The Regina, Sask. product now has 34 points (14G-20A) in 47 games. Overall, Focht has 75 points (30G-45A) in 180 WHL regular season games. 3. 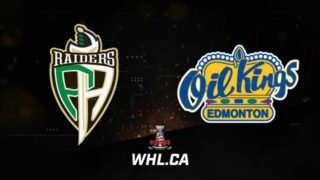 Josh Williams, Edmonton Oil Kings: 2019 NHL Draft prospect Josh Williams of the Edmonton Oil Kings had a goal and an assist Tuesday as the Oil Kings erased a 3-0 deficit to win 4-3 in the shootout. Williams scored the Oil Kings’ second goal of the game, then picked up a primary assist on the team’s third goal. The Langley, B.C. product now has seven points (3G-4A) in eight games with the Oil Kings as part of a 2018-19 campaign that has seen him record 28 points (12G-16A) in 49 games. Playing in the 100th game of his WHL career Tuesday, Williams now has 49 points (24G-25A). 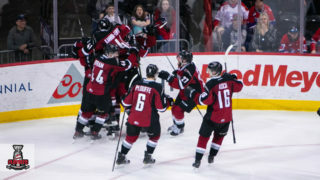 Two-goal nights from Regina product Carson Focht and captain Mark Kastelic propelled the Calgary Hitmen to their third-straight win in a 5-2 result against the Regina Pats. Kastelic did his scoring in the first, going to the front of the net 5:03 into the opening period and burying a rebound off a Kaden Elder shot for the game’s opening goal. The Pats responded minutes later by going to the net as well as Austin Pratt redirected a Brady Pouteau shot for his team-leading 19th goal of the season. Elder would set up Kastelic’s second goal of the night before the opening periods was completed, finding his captain on an odd-man rush with the captain burying his 32nd goal of the season into a wide-open net for the 2-1 goal. The Pats would tie up the game in the second off another tipped shot as Sergei Alkhimov got his stick on a point shot from Kyle Walker to even up the game. 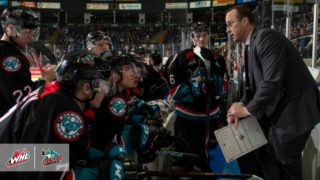 The Hitmen would press ahead for good later on in the period though thanks to the Queen City product Focht. Focht’s first was his sweetest of the night as he picked the top corner to help the Hitmen take their third lead of the game. On the power play near the end of the second, Focht received a perfect pass from Kastelic behind the net, placing it quickly into the back of the net for the insurance goal. In the third, James Malm added his 18th of the season on a heads-up pass by Vladislav Yeryomenko (Nashville Predators), who faked the shot, then found Malm on the opposite side of the offensive zone for the team’s second power-play goal of the night. In net, Jack McNaughton continued to play a steady hand for the Hitmen, stopping 21 of 23 shots. In his return to the net, Max Paddock stopped 33 shots in the loss. Elder finished with three assists while Kastelic had himself a three-point night as well with a pair of goals and an assist. Pats’ defenceman Makai Mitchell picked up the first point of his WHL career with an assist on the team’s second goal. No lead is safe in the WHL, a statement the Edmonton Oil Kings proved true Tuesday night against the visiting Brandon Wheat Kings. Down 3-0 near the midway point in regulation, the Oil Kings found a way to earn two points, storming back for a 4-3 shootout win against the Wheaties and extending their lead in the Central Division to three points. Ridly Greig opened the scoring as Ben McCartney found the Albertan unguarded in front for the game’s opening goal just 61 seconds into the first. Early on in the second, the Wheaties doubled their lead as a bad giveaway from the Oil Kings’ defence ended up in the back of their net moments later. Minutes later, 2019 NHL Draft prospect Luka Burzan made it a 3-0 game with his 27th of the season, jamming in the puck off a scramble in the around the Edmonton net. That’s when the Oil Kings found their spark. Just 187 seconds after Burzan’s goal, another 2019 NHL Draft prospect in Vladimir Alistrov was ready for the redirect at the side of the net as captain Trey Fix-Wolansky (Columbus Blue Jackets) found him with the perfect pass to get the home side on the board. The Oil Kings would have to wait until more than midway through the third for their next goal, as a lagging Wheat Kings’ defence resulted in Carter Souch and 2019 NHL Draft prospect Josh Williams down low with the puck and only the goalie to beat. Souch then made the selfless play to dish it off to Williams, who wasted no time in beating Ethan Kruger to bring the Oil Kings within a goal. They’d get that goal with 2:22 left in regulation as Williams fed a pass over to Andrew Fyten, with the veteran forward redirecting it past Kruger for the game-tying strike. Fix-Wolansky had the lone goal of the shootout to win it for Edmonton. Scott finished with 21 saves for the win. The Oil Kings peppered Kruger with 49 shots in regulation and overtime, with the rookie goaltender stopping 46 of them. Conner McDonald and Carter Souch each had a pair of assists from the blue line while Williams added a helper for the multi-point game. Wheat Kings captain Stelio Mattheos (Carolina Hurricanes) had a pair of assists in the contest while McCartney had a goal and an assist.